The Society publishes the Journal three times annually. It includes over 500 pages per year of Maryland source records, family histories, “how-to” articles to improve genealogical research skills, book reviews, and other features. The Journal is a must for anyone researching their heritage in the state of Maryland. The Bulletin, the predecessor to the Journal, was published from 1960 until 2007. The Bulletin, the predecesor to the Journal, was published from 1960 until 2007Click here to review the table of contents of the current issue of the Journal. If you want to read the entire issue cover to cover, become a member of the Society. It will be delivered to your door three times a year! Cumulative tables of contents are available for both the Bulletin and the Journal. As an exclusive member benefit, MGS members can view full-text searchable digitized copies of Volumes 1 to 38 of the Bulletin (1960-1997) in the Members Only area of the web site. After signing in as a member, look for the "MGS Bulletin Archive" link under Members Only on the lefthand navigation bar. Selected back issues of the Bulletin and the Journal are available for purchase (click here). To order copies of individual articles, please contact us for pricing by emailing info@mdgensoc.org or writing us at 201 West Monument Street, Baltimore, MD 21201. You may then pay by check or by using the PayPal button below. When ordering, we recommend that you note the article title, volume, and page numbers in the "Note to Seller" option on the PayPal payment page or in correspondence with your check. We encourage you to consider submitting an article for publication in the Journal. For more information on suibmission requirements and on opportunities for advertising in the Journal, see the following links. 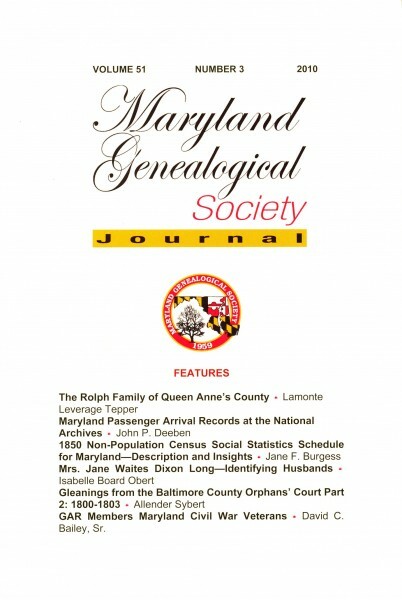 Since 1972, the Maryland Genealogical Society has published a newsletter to keep members abreast of items of ephemeral interest such as activities of the Society and other local historical and genealogical groups; new publication announcements; membership renewals; advertisements; deaths of members and local genealogists; as well as announcements of other current issues. Starting in 2018, the printed MGS Newsletter transitioned to a e-newsletter format with publication of the first issue of the MGS News. Receipt of MGS News is a benefit of membership, and archived copied of past newsletters are available to members in the Members Only section of the web site. If you would like to submit an item for possible inclusion in the newsletter, email newsletter@mdgensoc.org. “Leave No Stone Unturned” is a series of occasional articles in MGS News and its predecessor, the MGS Newsletter, by MGS Board Member Robert Barnes. Bob is the author of many source books, compiled family histories, and guides, and has taught many courses in genealogical research and lectured at genealogical conferences. An archive of his articles is available to MGS members in the Members Only section of the web site.